George Graham Reviews Clem Side's "Your Favorite Music"
The music business has changed profoundly in the last decade or so. Years ago, there were many independent record companies which had national distribution, and even the Big-Six major labels were quite diverse in their musical offerings. Since then, most of the larger independent labels have been absorbed into the increasingly large multi-national, multi-media conglomerates who own what are now the Big Five labels, soon to be the Big Four. Not surprisingly, with such an oligopoly in the record industry, the diversity of music available on the major labels has taken a nose-dive, with market-research-driven fad bands and fashion-statement performers pushing out all the even slightly interesting music. Filling the vacuum, though, are literally thousands of independent releases being issued by the performers themselves or small specialty/enthusiast labels, putting out everything from creative masterpieces to unlistenable thrashings by hopelessly inept garage bands. While there are plenty of the latter on the independent labels, most of the really interesting music is now being issued on the independent, but often hard-to-find record companies. It has gotten to the point that it's a rare event when a new band on a major label is something that I would select for this album review series. But once in a while, some intriguing new music will actually appear on one of the big pop labels. That is the case this week with the new release by a difficult-to-categorize band called Clem Snide, whose CD is entitled Your Favorite Music. It combines a kind of laid-back style of songwriting that hints at country music, vaguely jazzy vocals, with instrumentation prominently featuring a cello along with an acoustic bass, plus occasional bits of sound samples. It ends up sounding like a mixture of Michael Franks, Cowboy Junkies, Nick Drake and vague hints of the Beatles. 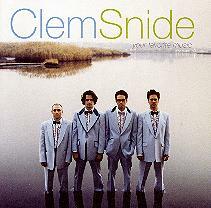 Clem Snide, was founded by an Israeli-born New Jersey raised singer-songwriter, guitarist and ex-art student named Eef Barzelay who played classic rock in cover bands in high school, then was attracted to jazz and attended the Berklee College of Music for a while. Barzelay met cellist and bassist Jason Glasser at Massachusetts College of Art, and they formed the first version of Clem Snide as a grungy alternative rock band. They named the group after a character in William Burroughs' novel "Naked Lunch." Barzelay and Glasser gravitated toward more laid-back sounds, as Barzelay was starting to draw his songwriting influence from country music. They moved to New York, recruited acoustic bassist Jeff Marshall and began to attract attention with their laid-back drum-less performances, and vaguely bohemian love songs. In 1998 they released an limited-distribution independent CD called You Were a Diamond, that eventually brought them to the attention of Sire Records, who signed them, and have just released the group's second album Your Favorite Music. Since their last CD, Clem Snide have picked up a drummer, Brad Reitz, but the group's sound remains what one critic described as "American deadpan," though Barzelay writes some lyrics with tongue in cheek, and there is a certain charming hip ennui about the songs. The lyrics are a basically a collection of stories about dates, some clearly less successful than others. But the group's most distinctive aspect is its curious blend of instrumentation, combining electric guitars with the melancholy cello, along with Barzelay's slightly smirky but appealing vocals. Your Favorite Music, the second CD by the New York based band Clem Snide is an interesting and ultimately charming CD that nicely showcases the group's limpid but often curious sound. Eef Barzelay's clever songwriting, specializing in exploring complicated relationships, along with the group's distinctive, cello-laden instrumentation and Barzelay's off-hand but amiable vocal style makes for intriguing listening with a sound that is both fresh and vaguely familiar. It's not a CD that attempts to make any grandiose statements, but through its casual eclecticism becomes a more memorable album than many of a more ambitious scale. In terms of sound quality, the CD is surprising good for a major-label release. The mix of acoustic and electric instrumentation well-handled. The dynamic range, while it could be a lot better, is also well above average for a pop album on one of the big record companies. The sonic presentation by producer/engineer Martin Brumbach does a decent job of capturing the often dreamy mood of the recording without getting too atmospheric. Clem Snide is a group that's difficult to categorize. Borrowing from the singer-songwriter scene, bits of alternative rock, the so-called romantic revival, country-influenced roots rock, Beatles-esque classical influence, and the renewal of interest in the British singer Nick Drake, about whom Clem Snide wrote a song on their debut album, they create a distinctive sound that is both appealing and slightly quirky. The fact that a recording this interesting would come out on a major label these days is somewhat surprising, and perhaps a hopeful sign.